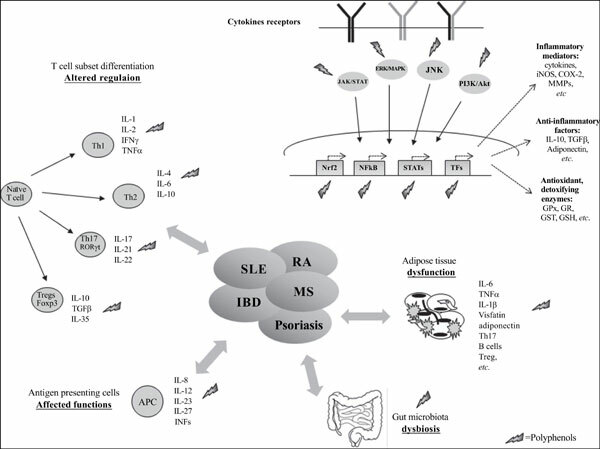 Background and Objective: Altered inflammatory response characterizes chronic immunemediated inflammatory diseases (IMID) such as rheumatoid arthritis, inflammatory bowel disease, multiple sclerosis, systemic lupus erythematosus, and psoriasis. Accumulating evidence indicates that regular consumption of extra virgin olive oil (EVOO), the main source of fat in the Mediterranean diet, is associated with a reduced risk of developing chronic degenerative disorders such as cardiovascular diseases, type 2 diabetes and cancer. The beneficial effects on health of EVOO have been attributed, besides to the monounsaturated fats content, to the presence of phenolic compounds that have antioxidant, anti-inflammatory and immunomodulatory properties. The purpose of this review is to provide an overview of the effects of EVOO polyphenols on IMID highlighting the potential mechanisms of action. Methods: Scientific papers were found by searching in PubMed up to May 2017 using the following key words: rheumatoid arthritis, inflammatory bowel disease, multiple sclerosis, systemic lupus erythematosus, and psoriasis also in combination with EVOO, phenolic compounds, oleuropein, oleocantal, hydroxytyrosol,tyrosol and oleochantal. Results: In vitro and in vivo studies indicate that EVOO and its polyphenols can improve diseases symptoms in IMID, by acting both at local and systemic levels and by modulating several molecular pathways. Nevertheless, there are not sufficient data to achieve specific nutritional guidelines. Conclusion: Further research is needed to evaluate the real contribution of EVOO and its phenolic compounds in modulating the IMID-associated inflammatory perturbations, in order to develop appropriate nutritional recommendations. Keywords: Anti-inflammatory, antioxidant, extra virgin olive oil, immune-mediated inflammatory diseases, phenolic compounds, EVOO polyphenols. Title:Anti-inflammatory Activity of Extra Virgin Olive Oil Polyphenols: Which Role in the Prevention and Treatment of Immune-Mediated Inflammatory Diseases? Keywords:Anti-inflammatory, antioxidant, extra virgin olive oil, immune-mediated inflammatory diseases, phenolic compounds, EVOO polyphenols. Abstract:Background and Objective: Altered inflammatory response characterizes chronic immunemediated inflammatory diseases (IMID) such as rheumatoid arthritis, inflammatory bowel disease, multiple sclerosis, systemic lupus erythematosus, and psoriasis. Accumulating evidence indicates that regular consumption of extra virgin olive oil (EVOO), the main source of fat in the Mediterranean diet, is associated with a reduced risk of developing chronic degenerative disorders such as cardiovascular diseases, type 2 diabetes and cancer. The beneficial effects on health of EVOO have been attributed, besides to the monounsaturated fats content, to the presence of phenolic compounds that have antioxidant, anti-inflammatory and immunomodulatory properties. The purpose of this review is to provide an overview of the effects of EVOO polyphenols on IMID highlighting the potential mechanisms of action.